Recorded 1961 in Webster Hall, New York. Recording Engineers: Bob Simpson and Ray Hall. My album is autographed by Arthur Williams. 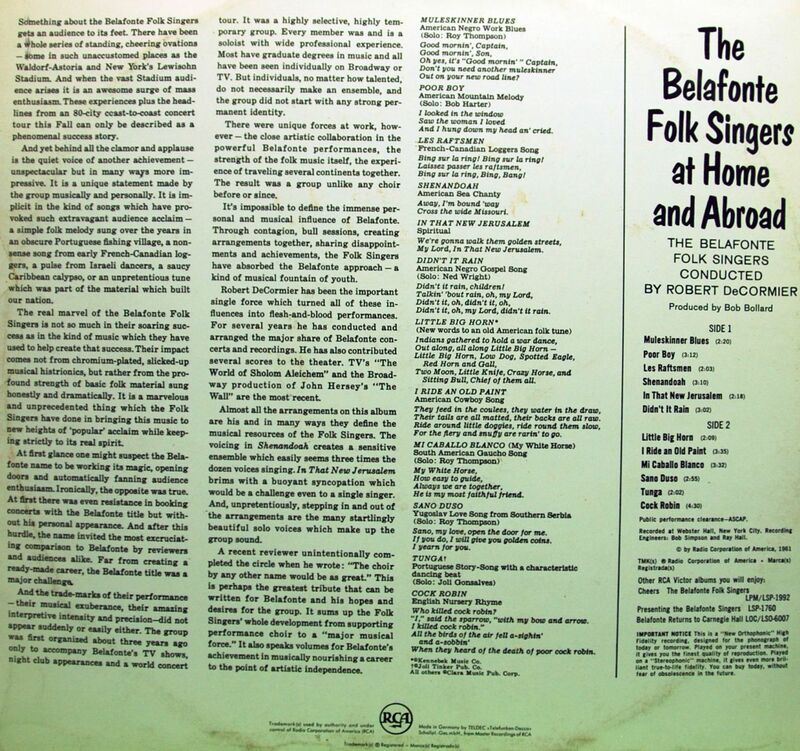 It's a shame the Belafonte Folk Singers only recorded three albums. It was inevitable, however, that their fame would be short-lived, limited to those three albums cut in as many years. Groups consisting of twelve members are difficult to maintain financially, even in the go-go '60s when folk music was all the rage. But also, the esoteric subject matter they performed, mostly without accompaniment, was hardly the stuff of broad-based popularity. 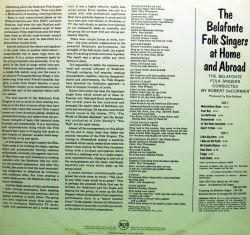 Nevertheless, this third and final album of the Singers' trilogy on RCA again examined songs from different cultures, some of which ("Muleskinner," "Shenandoah") had been performed by Belafonte. Robert Corman, this time using the sobriquet "Robert DeCormier," was again the conductor on this album, which featured mostly songs from American folk tradition. One would like to know the names of all of the singers; the notes on the three albums only pointed out the featured soloist on each track. 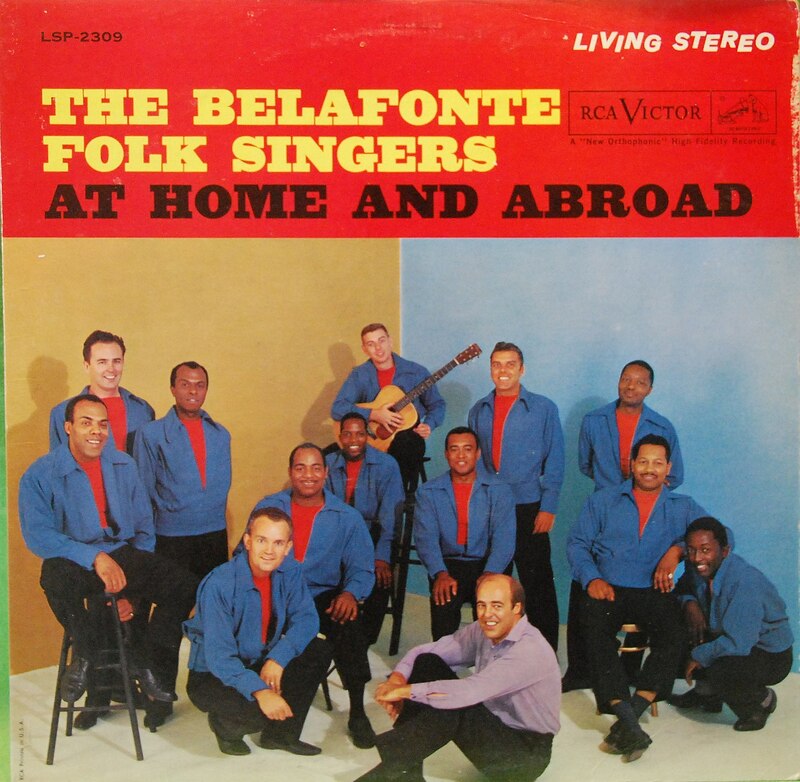 What is especially noteworthy in looking back at this remarkable group is that they looked at American folk music in a non-racial manner, mixing black and white traditions as easily as their voices blended.